In this tutorial I will show you how to create a Microsoft login button for your website using PHP. To start with, let’s answer the question: What is OAuth? OAuth is a protocol used to allow secure authorization to websites and applications to access user information on other websites. There are two versions of OAuth, 1.0 and 2.0. In this post we will use OAuth 2.0 to build a Microsoft login system. 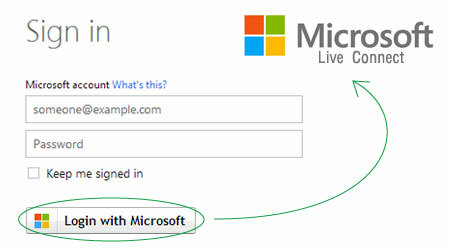 Microsoft Log-in means asking user to grant access to his/her Microsoft live information like email id, username etc. Once your website has been granted access and has all these information about the user it can allow the users to access protected pages on your website. Before we get started you need to create a PHP file named redirect.php. Place this file anywhere in your webspace. Select API Settings and for redirect URL pass URL pointing to the redirect.php file. Scopes represent the list of permissions for the app. You need to pass a comma separated list of permissions. List of all scopes. Populate the $client_id and $redirect_uri variables. Once user has given access to the app, Microsoft will redirect user back to the redirect URI. Now you need to retrieve an access token which acts like a permission to get user information. Populate variable $client_id,$client_secret and $redirect_uri. Finally we got $access_token and $refresh_token. $access_token usually expires in 1 hour therefore $refresh_token is used to get a new access token after every 1 hour. If access token is expired then you are likely to get an error in HTTP response content while making requests to REST APIs. You can find list of all REST APIs at Microsoft REST API reference. All the requests to these APIs must be made using the access token. WordPress is made on PHP therefore all code will be same for authorizing user and getting profile information. To create a redirect URL in WordPress use WordPress AJAX API. If you want to more than just Login then increase the permissions in permission list and store the access token and refresh token in database for further use. Make sure you update the access token when its refreshed. Don’t share the client secret with anyone. Published at DZone with permission of Zachary Bedell . See the original article here.